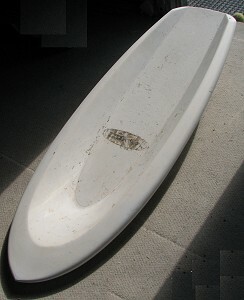 1975 Ron Wade Molded Spoon Knee Board 4 ft 10"
MANUFACTURER: Ron Wade Surfboards, Mona Vale NSW. Phone 997-5442. Hollow molded board with white gel coat, (probably) molded fin, adhesive decal. 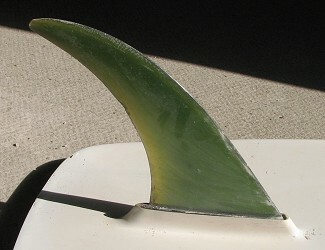 The original fin appears to be molded into the bottom but has been replaced with a laminated fin inserted into the original fin's base. 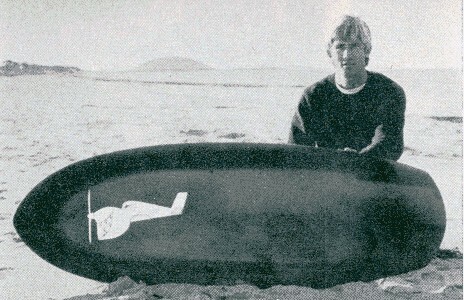 Deck:RON WADE SURF BOARDS 997-5442, black text and script on an adhesive decal at the sweet spot. The decal is scuffed and damaged. Deck: white pigment gel coat. Bottom: white pigment gel coat. Dimensions and photographs DSN Surfboards, Gerringong NSW, 23 May 2008. 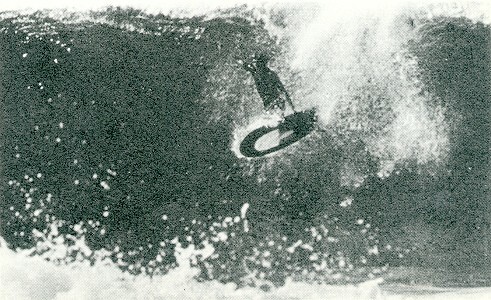 Board from Jade Robinson collection.